Ben Griffiths, Portfolio Manager, European Smaller Companies Equity Strategy, discusses his views on the European small cap space, the potential headwinds and tailwinds for 2019, and his view on valuation levels. How do you see the market landscape in 2019? I expect that 2019 will differ from 2018 but it will in many ways probably resemble the second half of 2018. We saw a big change obviously in sentiment during 2018 from a very low volatility and relaxed market environment to one which was really the polar opposite of that. And I think that that probably continues through 2019. The reason for that is again the removal of stimulus which has been happening, as well as potential trade wars and a macro slowdown that we’re seeing. So, on top of the political worries I see in the world, this in my mind should really lead to a much more volatile market in 2019 than we’ve seen in 2018 and indeed in previous years. What are the main headwinds and tailwinds for the region? For me the main headwind is the removal of stimulus that is going on around the world. We’re seeing rates rising and fiscal easing being limited. And this is, this end of the easing money era is definitely very relevant to my investments. It means that there’s just less money chasing the kind of assets I want to invest in. On the other hand I also see sustained tailwinds still in the market. And these will mostly be structural tailwinds in my view around areas such as the shift to ecommerce and new industries indeed taking over and replacing old industries in my mind in the world. So this big economic structural shift that we already see happening now I think is sustained and will carry on for the next few years. And fortunately, my portfolio invests in these type of companies, so hopefully this tailwind will carry on driving many of my companies forward. What is your view on valuations in European small cap? My view on valuations in small cap is actually that now they look fairly attractive. If I look at the valuations of the small cap index overall it is now at a fairly attractive level versus a kind of earnings growth that you can expect. This is an attractive asset class for me which does tend to grow. I also like to look at the valuation of the type of companies which I look into my own portfolio of stocks, which tend to be higher quality, higher growth and hence higher valuation stocks. When we look at this number, we actually see that that’s contracted even more than maybe the overall market has recently. So in my view this means that those high growth stocks are now on a relative basis, more attractive than the market overall. The following risks are materially relevant to the strategy highlighted in this material: Transactions in securities of foreign currencies may be subject to fluctuations of exchange rates which may affect the value of an investment. Investment in small companies involves greater risk than is customarily associated with larger companies, since small companies often have limited product lines, markets or financial resources. This material is being furnished for general informational purposes only. The material does not constitute or undertake to give advice of any nature, including fiduciary investment advice, and prospective investors are recommended to seek independent legal, financial and tax advice before making any investment decision. 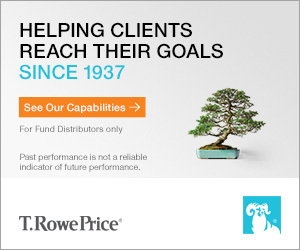 T. Rowe Price group of companies including T. Rowe Price Associates, Inc. and/or its affiliates receive revenue from T. Rowe Price investment products and services. Past performance is not a reliable indicator of future performance. The value of an investment and any income from it can go down as well as up. Investors may get back less than the amount invested. The material does not constitute a distribution, an offer, an invitation, a personal or general recommendation or solicitation to sell or buy any securities in any jurisdiction or to conduct any particular investment activity. The material has not been reviewed by any regulatory authority in any jurisdiction. Information and opinions presented have been obtained or derived from sources believed to be reliable and current; however, we cannot guarantee the sources' accuracy or completeness. There is no guarantee that any forecasts made will come to pass. The views contained herein are as of the date written and are subject to change without notice; these views may differ from those of other T. Rowe Price group companies and/or associates. Under no circumstances should the material, in whole or in part, be copied or redistributed without consent from T. Rowe Price. The material is not intended for use by persons in jurisdictions which prohibit or restrict the distribution of the material and in certain countries the material is provided upon specific request. It is not intended for distribution to retail investors in any jurisdiction. DIFC—Issued in the Dubai International Financial Centre by T. Rowe Price International Ltd. This material is communicated on behalf of T. Rowe Price International Ltd. by its representative office which is regulated by the Dubai Financial Services Authority. For Professional Clients only. EEA—Issued in the European Economic Area by T. Rowe Price International Ltd, 60 Queen Victoria Street, London EC4N 4TZ which is authorised and regulated by the UK Financial Conduct Authority. For Professional Clients only. Switzerland—Issued in Switzerland by T. Rowe Price (Switzerland) GmbH, Talstrasse 65, 6th Floor, 8001 Zurich, Switzerland. For Qualified Investors only. 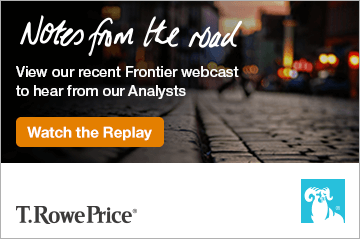 T. ROWE PRICE, INVEST WITH CONFIDENCE, and the bighorn sheep design are, collectively and/or apart, trademarks of T. Rowe Price Group, Inc. © 2019 T. Rowe Price. All rights reserved. T. Rowe Price is a global independent investment management firm, managing over £790 billion across a range of strategies in equity, fixed income and multi-asset in order to provide investment solutions for clients. Our investment approach is solidly rooted in teamwork, fundamental research and taking a long-term perspective, while at the same time carefully managing risk. We established our London office in 1979 via the joint venture, Rowe Price Fleming International, and in 2000 began operating in the UK and Ireland as T. Rowe Price International. Today we have over 390 Employees based in London and operate in 16 countries worldwide. For professional clients only. This material is not intended for use by retail clients. Past performance is not a reliable indicator of future performance. The value of an investment and any income from it can go down as well as up. Investors may get back less than the amount invested. Issued in the European Economic Area by T. Rowe Price International Ltd, 60 Queen Victoria Street, London EC4N 4TZ which is authorised and regulated by the UK Financial Conduct Authority. T. ROWE PRICE, INVEST WITH CONFIDENCE and the Bighorn Sheep design are, collectively and/or apart, trademarks or registered trademarks of T. Rowe Price Group, Inc. All rights reserved.